1 How to brew tea with ginger? 2 How to drink tea with ginger? Ginger (white root, horned root) - is a useful and long known to mankind spice, which is widely used in the national cuisine of many nations. Contains B-vitamins, BUT, WITH, useful amino acids, minerals (magnesium, iron, potassium, zinc, phosphorus). It has many medicinal properties. Another ancient Chinese healers have used ginger root to combat hypothermia. Forever zyabnuschie British also noticed, that tea with ginger root perfectly warms, It helps to retain heat. therefore, because of the traditional English weather, Ginger tea is quite a frequent guest at their table. it is known today, what ginger tea It helps strengthen the immune system, the sensation of hunger, increases metabolism, that promotes weight loss and reduces weight, It reduces the level of cholesterol in the blood, removes toxins, toxins, fights harmful bacteria, It improves blood flow and the cardiovascular system. His drink to calm the nerves, for clarity of mind, colds and digestive problems, to relieve fatigue. How to brew tea with ginger? Slice selective ginger the size of a small plum, should be cleaned and grate. The resulting mass is poured water 2 glass and boil 10 minutes. In the water you can add strawberry leaves, melissa, cinnamon, cardamom, cloves, and make it green or black tea. Grated ginger put in a thermos, pour boiling water, add green tea from the calculation 1 ch.l. a glass of water and infuse for half an hour. Take a litre of water and bring to boil, put the grated or finely cut ginger, again bring to a boil and off heat. Infuse a quarter of an hour, a squeeze of lemon, put honey to taste and stir, still insist 10 minutes, before use, strain, add some fresh tea infuser. Brewed in the teapot to put black, better tea, a few records of ginger root and pour boiling water, insist 10 minutes. 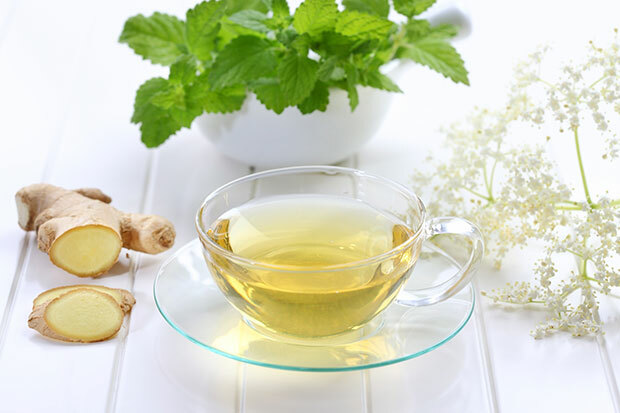 Drinking ginger tea can be like an ordinary, with lemon, honey, spices, herbs. You should find your proportions of ginger, often because for some people the amount in the recipe is normal to taste, but for others it is too burning. Allergy, stomach ulcer, colitis, pregnancy and breast-feeding, fever, stones in the gallbladder.